[t1] Canada Conserves is an initiative to build a common voice across Canada that says conservation – living better with less – can be the foundation for a completely new way of looking at society, economics, and governance. We believe a better future for Canada is possible, but only if we focus on solutions that help us live better with less – solutions that save us money, create local jobs, and improve our communities and quality of life. We believe it is time to focus on the future we want. In 2012, we started out on an ambitious agenda – to be a catalyst for the next wave in environmental and sustainability leadership. The project was initiated by Chris Winter, a 30 year veteran of the conservation movement in Ontario, backed up by an impressive advisory committee, and hosted as a collaborative project through Tides Canada. The environmental, economic, and social trends are all negative, and they are interconnected. Culture is at the root of both the problems and the solutions. We need to address the root causes in order to create a culture of change. We can build deep cultural support by focusing on creating a better future for Canada via solutions that help people live better with less. There is a gap between environmental activism (lobbying for change) and empowerment (helping people to act). They are two separate movements when they should be one. 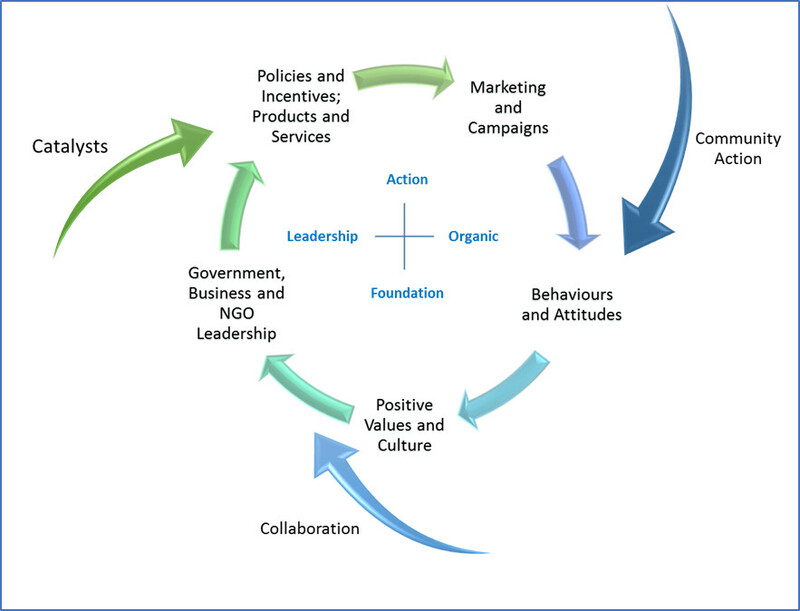 Our last report in the research series, “Achieving the Future Canadians Want“, proposed a new approach based on a cycle of change and three major points of intervention: collaborative leadership, leading to major catalytic initiatives and community-based support for organic, voluntary change. Policy empowers action which builds support for leadership. Time now to shift to action. “Achieving the Future Canadians Want” lists twenty ideas for action – from stronger support for community action to a national collaborative vision of the future we want. These are common sense recommendations, but they also require commitment and leadership. There are actions we can take now, and these have become Phase Two of the Canada Conserves initiative. The deeper, transformative initiatives become Phase Three of the initiative – a sign of a deeper commitment by our social, business, and political leaders to long-term sustainability in Canada. Building a better long-term approach to sustainability is a team effort. We all need to look at the role we play in empowering change. Here’s how we can help. Work with our project director or a team of advisors to develop new approaches. Short term: If you need advice on how to integrate cultural sustainability into your organization strategy and programs, please drop us a line. We can provide you with an overview of opportunities. Medium to Long Term: we can help design overall strategies and programs to maximize success in supporting a voluntary transition and building deep cultural support. Develop specific projects to build capacity for voluntary change. Contact us for details. Count Us In: As the federal and provincial governments draft new climate plans, it’s time for a campaign to promote plans that include people as part of the solution. [/t3][t4]These are the high-level initiatives identified in “Achieving the Future Canadians Want“. They are beyond the immediate scope of this initiative and will require leadership from senior organizations in Canada.